Today I'm pleased to shut up and invite you to listen to Kelly Starling Lyons, author of ONE MILLION MEN AND ME. 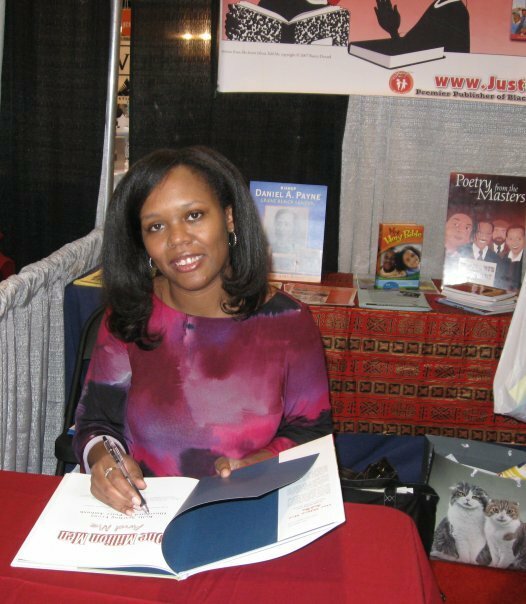 Kelly and I met at the Multicultural Book Festival in Washington D.C., an encouraging, enthralling experience for both of us. 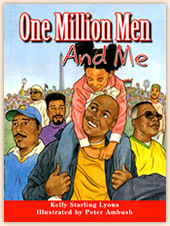 When I wrote One Million Men and Me (illustrated by Peter Ambush, published by Just Us Books), one of my dreams was to share it in Washington, D.C. I wanted to go back to the city where the Million Man March happened and celebrate the story with kids. I got my chance the year it debuted. I was part of the Multicultural Children’s Book Festival at the Kennedy Center. As I rode from the airport to the hotel, I thought back to that amazing event. I remembered walking through a sea of black men, seeing strangers embrace like brothers, watching people — young and old, rich and poor — praying and laughing together. I remembered a little girl I saw that day clutching her daddy’s hand. Her eyes glistened and sparkled at the sight of men everywhere. My desire to see the March through that sweet girl’s eyes inspired my story. I named her Nia, because I felt she was there for a reason, just like me. 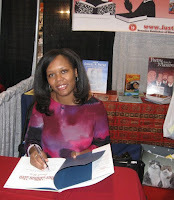 Being in D.C. to share the book she, her father and a tapestry of men inspired was like coming full circle. At the Kennedy Center, a special energy flowed through the air. There was something magic about the idea of people from different backgrounds and cultures coming together to celebrate literature reflecting children of color. There with wonderful authors and illustrators like Mitali Perkins, Christopher Myers, Tonya Bolden, Lulu Delacre and more, I got ready to greet them. It wasn’t long before I realized this would be different from anywhere else I had been. As people came up to meet me and have their books signed, they brought their testimonies. Men smiled as they flipped through the pages and said it took them right back to that historic event. A father looked at the cover of One Million Men and Me with Nia on her dad’s shoulders and remembered carrying his own daughter around the March that way. I met twin girls whose dad pushed them in a stroller around the March when they were 4-month-old infants. And women who proudly told me they took their sons to the March or cheered their husbands as they went. For these people, One Million Men and Me was a touchstone and a reminder of what that day meant. I felt so honored that the book brought a piece of the March to life. But one of my most special moments came from two boys who never heard of the March. They had each won gift certificates from school for earning good grades and had enough money to buy a couple of books each. Those young men were determined to make just the right choice. They went from table to table, flipping through books and asking questions. When they visited me, I told them about the March and seeing that little girl there with her dad. They listened, smiled and moved on. I was talking to another person when I looked up and saw them again. They smiled and waited their turn. When they came up to my table, they told me they both chose One Million Men and Me as one of selections. On their own, without prompting from a teacher or a parent, they picked my book. I think I could have flown all the way home. When you write a book, you hope it will touch children. And on that beautiful day at the Kennedy Center in Washington, D.C., two boys let me know that I made a difference. That meant everything to me. thank you for the book. I like the part when they prayed together that might stop the fighting around here. I love your book, One Million Men and Me. I like it when it says: I am a Man. I am one in a million. That was my favorite part. I love your book One Million Men and Me. It reminds me of a lot of men in my family. It's a very, very, very nice book. Thank you for coming to my school. “I enjoyed your book. I like how you use lots of details in your story. I like the part when you said, ‘One million black men. One million black kings.’ I hope you make another one soon. Thank you so much, Kelly. Your post reminds us of the beautiful purpose of this vocation, and I'm honored to be a stop on your ONE MILLION MEN AND ME anniversary tour. Here's the overview of the tour and full schedule. Also, anyone who posts a comment there, on this blog post, or on Kelly's FaceBook author page qualifies to win one of three prizes: A ONE MILLION MEN AND ME T-shirt, tote bag or signed poster. Kelly will announce the winners on the actualy march anniversary, October 16.